Elli AvrRam at Filmistan Studio in Mumbai. 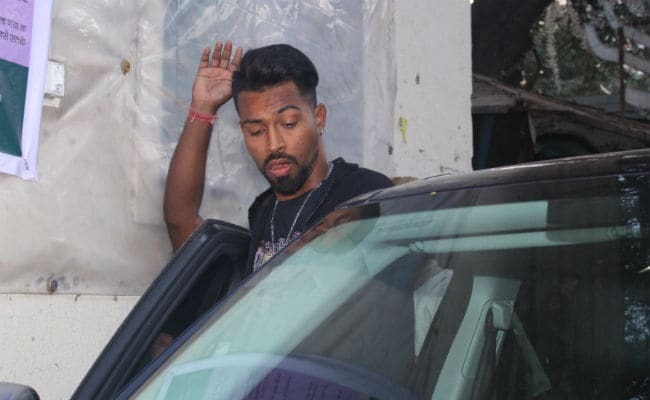 Actress Elli AvrRam, who is reportedly dating Hardik Pandya, was photographed in Mumbai with the cricketer on Tuesday. Elli, looking cute in distressed denims and a yellow top, was spotted at Filmistan Studio in Goregaon, where Hardik was shooting for an advertisement. Elli and Hardik carefully avoided being photographed together but the shutterbugs did catch them around. Elli AvrRam attended Hardik's brother Krunal Pandya's reception in December last year, which became the seed of the rumours. They've been spotted together several times in the last few weeks, including at the airport, the pictures of which went viral. Elli and Hardik have not made any statement about their relationship nor have they featured in each other's social media posts. If the rumours turn out to be true, then Elli and Hardik will be the latest actress-cricketer jodi after Virat Kohli and Anushka Sharma and Sagarika Ghatge and Zaheer Khan, who got married last year. Elli AvrRam is a Sweedish actress, who became a household name after featuring in Bigg Boss 7. She made her Bollywood debut opposite Maniesh Paul in Mickey Virus in 2013. She went on to star in films such as Kis Kisko Pyaar Karoon and Naam Shabana. Elli AvrRam also featured in a special song in Poster Boys. Elli AvrRam's upcoming projects are the Telugu and Tamil remakes of Kangana Ranaut's Queen. She will step into Lisa Haydon's shoes for both the remakes. On the small screen, Elli AvrRam was last seen as the host of Great Indian Laughter Challenge.